This project was the winner of a national public art competition to commemorate the Free Speech Movement at the University of California at Berkeley. Instead of using traditional sculptural materials such as bronze or stone this monument uses the political process to sculpt a space free from any outside jurisdiction. A six inch column of land and airspace are legally redefined as not being a part of any nation, state or city therefore no laws are applicable within the small space. This free space acts as focal point for speeches where people participating in free expression become living monuments to free speech. 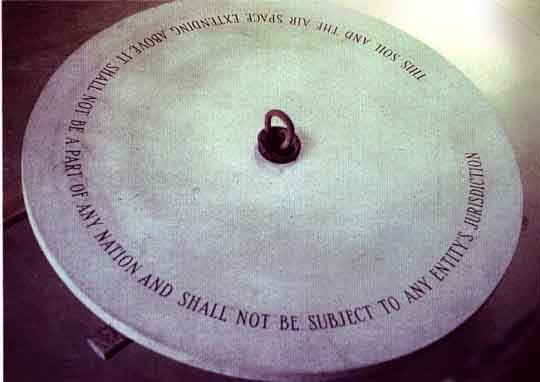 A granite ring surrounds the land and bears the inscription: "This soil and the airspace extending above it shall not be a part of any nation and shall not be subject to any entity's jurisdiction." Although the proposal won the competition and also was the favorite in a public poll, UC Berkeley's administration was reluctant to install a commemoration of the Free Speech Movement in general and was specifically uneasy with this project's anarchistic undertones. in Sproul Plaza on UC Berkeley Campus. After two years of negotiations, the University declared that it would accept the monument only if no mention was made of the Free Speech Movement in the press release. This was a doubly ironic request since what they were requesting was a repression of free speech. After much soul searching by all involved, it was decided to go through with the installation since everybody understood that the context of the piece was the Free Speech Movement already. The sculpture continues to live and change as people use the space. Two weeks after the installation of the monument it was completely covered with graffiti. The University, exercising its own freedom in the space, cleaned the graffiti off after a few months. The result is that people freely graffiti the monument with their thoughts and the University erases it four times a year, everyone is playing their own role perfectly.